Carotenemia is a condition that arises with high levels of carotene in the body. Carotene can cause a discoloration of the skin when present in large amounts within the body. This discoloration is typically yellow and sometimes even slightly orange in color. Carotenemia is a harmless condition and will ease with just dietary change alone. Although it can occur in any age group, it is more commonly seen in young children and vegetarians in particular. It is more often reported in individuals with lighter complexion as the yellow hue is more clearly visible but may occur in a person of any skin color. There are several terms that are associated with carotenemia and are often used interchangeably. Carotene related changes in the body like high levels in the blood and skin discoloration is collectively referred to as carotenosis. Hypercarotenemia more correctly refers to excessively high carotene levels in the blood rather just carotenemia. Carotenoderma is the presence of large amounts of carotene in the skin. Xanthoderma is a yellow discoloration of the skin of any cause. Carotene is a pigment found in many yellow, orange and red fruits and vegetables and even in green vegetables to some extent. It is important for the process of photosynthesis where plants use sunlight for their metabolic needs. Carotene is not toxic to humans and is part of a healthy diet. It is not a single compound but rather a group of substances. One of the common forms in the human diet, beta-carotene, is converted to vitamin A. Therefore carotene is an essential nutrient for humans and will not cause any symptoms when consumed in moderation. It is beneficial for the skin, eyes and fetal development in pregnancy. The excessive consumption of carotene-rich foods raises the carotene levels in the blood. This is known as carotenemia and the carotene is distributed throughout the body. Carotene is converted into vitamin A very slowly. Therefore carotenemia will not lead to vitamin A toxicity (hypervitaminosis A). Since carotene itself is non-toxic, even in large quantities, there is no complications associated with excessive consumption of carotene-rich foods. Carotene deposition occurs in various tissues. It is more evident in the skin when the outer skin layer, the stratum corneum, is thickened. Highly levels of carotene are also more likely to cause skin symptoms when it is deposited in large amounts within the fat under the skin – the subcutaneous fat. 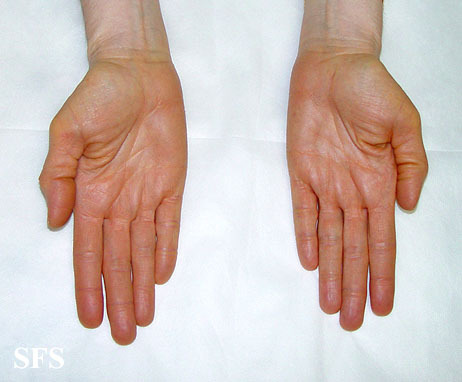 The yellow discoloration is more prominent in the hands, and especially the palms with its lighter complexion than the rest of the skin. The ‘whites’ of the eyes (sclera) and the inner lining of the mouth are not discolored in carotenemia but may be so in other conditions association with a yellowish tinge of the skin, like jaundice. Carotenemia should not be confused with jaundice which is yellowish discoloration of the skin mainly associated with liver and gallbladder disease. Unlike jaundice, carotenemia is fairly harmless and dietary change alone can undo the yellow discoloration of the skin. Jaundice on the other hand needs immediate medical attention although in some instances it can resolve spontaneously. It is important to note that jaundice describes a clinical presentation and is not a disease on its own. Jaundice is seen with a range of conditions including some blood disorders and copper poisoning. 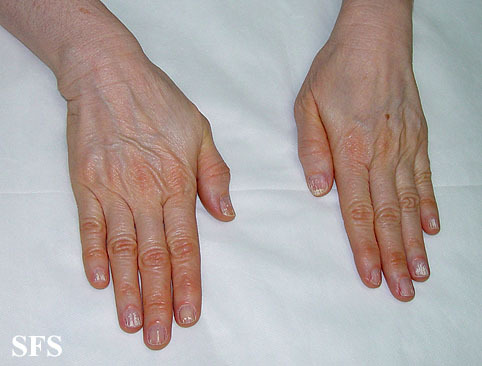 Carotenemia is often misdiagnosed as jaundice due the similarity in clinical presentation. One of the distinguishing features between carotenemia and jaundice is that the sclera (whites of the eye) and inner lining of the mouth is also discolored yellow in jaundice. It is not so in carotenemia. Although thus far it has been stressed that excessive carotene intake is harmless, it should be clarified that the intake of carotene-rich foods do not lead to any further complications. There is evidence to suggest that overuse of beta-carotene supplements on the other hand, is associated with an increase risk of cancer. As mentioned, carotenemia occurs with the excessive consumption of carotene-rich foods. Carrots are by the far the most common cause. The pigmentation of the skin associated with high carotene intake is therefore referred to as primary carotenemia. There are certain diseases that can also contribute to carotenemia. If carotene is not metabolized as it normally should be then it can accumulate in the system even if consumption of carotene-rich foods are not excessive. Since carotene absorption is associated with dietary fat, certain conditions can therefore increase carotene absorption and retention within the bloodstream. Discoloration of the skin in these instances are known as secondary carotenemia. It is not due to excessive carotene intake but rather a disturbance in the way the body deals with carotene. The main and only symptom is a yellow tinge of the skin. In rare cases it may be somewhat yellowish-orange in color but never red. This yellowish discoloration of the skin is known as xanthoderma. It is most prominent on the palms of the hand and soles of the feet. Since no other symptoms are present, it is probably more worthwhile to look at symptoms that will NOT be present with carotenemia. However, sometimes other diseases of the skin or systemic illnesses may cause some of the symptoms that will typically be absent in carotenemia. Green discoloration of the skin or hair (seen with contact with copper). Picture from Dermatology Atlas courtesy of Samuel Freire da Silva, M.D. Clinical examination of the skin with a clearly discernible yellow tinge of the skin is the main feature that is noted. If the sclera and inner lining of the mouth are not discolored, then a preliminary diagnosis of carotenemia may be made. It is further confirmed by a medical history indicating an excessive consumption of carotene-rich foods. However, further tests should be conducted to conclusively confirm the diagnosis. Beta-carotene blood tests may indicate carotene levels about 3 to 4 times higher than normal. Skin biopsy with microscopic examination of the skin sample . Liver function test (LFT) which is usually normal in carotenemia. There is no treatment that is necessary for carotenemia. It is a harmless condition that resolves on its own without the need for any medication. A dietary change should be commenced where there is a low intake of carotene-rich foods. However, these foods should not be avoided altogether in the long term as carotene is an important nutrient. These dietary measures are sufficient for primary carotenemia. However, with secondary carotenemia, the underlying disease that is leading to an excessive accumulation of carotene in the bloodstream needs to be attended to.